Day 1 of the Warhammer 40K Grand Tournament. After a night of drunken fun at The Pit & Pendulum (where Luke bought an inflatable pig! ), we woke up the next day to a mighty fine cooked breakfast before walking through town and along the canal to Warhammer World for day 1 of the Warhammer 40K Grand Tournament. Having sold my Tau army to a chap from Spain on Thursday, this would be their last tour of duty, so I had high expectations of them. I've decided to take a break from this army, but I will build a new Tau force when the new Tau Empire Codex is released. My Battlesuits will definitely be magnetised the next time around too! I made some last minute amendments to my army as I was 2pts over the limit. 2 man Broadside Team with Advanced Stabilisation Systems. We arrived a little late, so we quickly found our tables and met our first opponents. I had been drawn against a chap named Leonidas (cool name!) who spoke a little English. I was delighted to see a well painted Khorne Chaos army across the board from me, but never imagined just how wrong my first game would go. We rolled for the number of objectives and ended up with 4. Then Leonidas won the roll off, opting to go first. He was clever with his objective placement so that almost all 4 were around the centre of the board. He deployed his forces centrally with a Land Raider either side and the Rhino on the left flank. Bezerkers and Terminators were in their transports on the left while Bezerkers were in the Land Raider on the right with the Daemon Prince hidden behind it and the Daemon packs in reserve. Due to the line of sight blocking terrain on the board, I was forced to place a Hammerhead on the far right flank, Broadsides in the middle (big mistake! 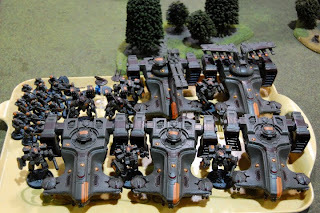 ), Battlesuit command team in the middle (another mistake!) and Skyray on the left flank. The Khorne vehicles surged forward the full distance into the middle of the board, firing their smoke launchers. All the Tau railguns hit home, but couldn't see past the smoke launchers as Leonidas passed all his 5+ cover saves. The disembarking Terminatords and Khorne bezerkers were just (like 1mm) within charge range of the Broadsides and Battlesuits...who died spectacularly. The Devilfish transports arrived, as did the Battlesuit team with twin flamers, sweeping around the sides of the board, firing as they went, but doing very little. The Daemon Prince jumped on the Hammerhead and ripped off the railgun. The Daemon packs arrived, deepstriking and running to claim 2 objectives while the Land Raiders continued to advance, parking on 2 more objectives so that they couldn't be contested due to the sheer size of the vehicles. 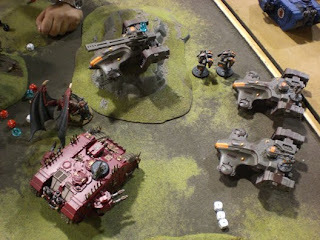 The Terminators made short work of 1 Devilfish while the Land Raiders took out the other with their lascannons, leaving the Tau Firewarriors dangerously exposed. While 1 Devilfish was able to contest an objective on the far left flank and the Hammerhead eventually made it round the the Khorne deployment zone to contest another objective, Leonidas had clearly claimed 2 objectives in my deployment zone with Bezerkers embarked inside his Land Raiders. To make things worse I hadn't brought a single unit below half strength, but for his Daemon Prince who miraculously passed 18 armour saves in the last round. Leonidas won with 2 objectives to 0 and over 1000 victory points. When I couldn't at least immobilise one of his Land Raiders I knew I was in big trouble. It was also unfortunate that my Battlesuits were literally millimetres within charge range. I should have put the Broadsides on the far left flank while the Hammerhead was on the right, then done my usual sweeping around the sides tactic. Although I needed a 'juicy bone' in the middle to bait him in for that to work. If I could get a 2nd turn of firing with the Broadsides, then maybe things wouldn't have been so bad. Then I could immobilise the Land Raiders and sweep round to his side of the board. The game would still probably end in a draw, but that's the way things go with the Tau right now. "That word doesn't translate very well" I said. "Because in English 'impotent' means that you can't get an erection." We left our armies out for judging and then made our way into the cantine for some dinner before resuming the games. Just one look at Luis army and I knew my tanks were in trouble, my Battlesuits were in trouble and, well, that's a lot of AP2 guns. Luis also didn't speak much English beyond the words 'Dark Lance', but had an English copy of his Codex to point at. This game was not only a lesson in tactics for me, but also international sign language! I won the roll off, choosing the most open corner (for my tanks to cruise around) with some woods and an impassable hab-dome terrain peice, which I placed my Objective behind. Luis then placed his Objective in the opposite corner, in the far right corner behind another hab-dome. I wouldn't be going all the way over there for his objective. So which his army much faster than mine and having more powerful guns than mine, I chose to defend my objective. Dark Eldar are very fragile, so with the first turn, I set up everything on the board with my tank wall up front, Battlesuits behind and Broadsides in the far back corner. I kept a Devilfish with some Firewarriors in near my objective at all times. Luis then deployed his Dark Eldar Warriors squads in the woods and ruins with their Dark Lances aimed at my tanks. Meanwhile the Ravagers, Raiders and Jetbikes were held in reserve, just as expected. The Tau tank wall advanced, firing on the Dark Eldar Warriors in the nearby ruins, but killed very few. In return the Hammerhead and Skyray were both stunned by the Dark Lances and unable to move or shoot next turn. 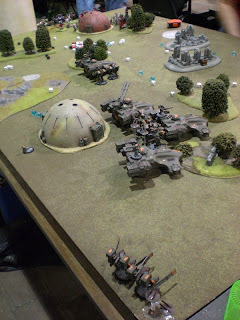 The Tau continued shooting at the two squads in the ruins until they were wiped out. But by this time, one of the Ravagers and 2 of the Raiders had arrived from reserve and blew the Skyray apart. The newly arrived Dark Eldar skimmers were in turn blasted apart by Battlesuit missile pods and railgun slugs from the Broadsides. Lots of explosions! As the battle went on it looked as though the Tau had gained the upperhand with the light Dark Eldar skimmers arriving, inflicting minor damage and then exploding one by one...until the huge Dark Eldar Jetbike mob led by two characters arrived and began speeding down the left flank. With nothing else important to shoot at, the entire Tau army turned their guns on the speeding vehicles, gradually gunning them down until only the Archon and a single Reaver Jetbiker remained...until they were gunned down in the following turn. The game ended with each of us holding a single objective. While this battle went like textbook for the Tau, I simply couldn't risk moving away from my objective due to the sheer volume of firepower needed to take down all those Dark Eldar jetbikes in time. My friend Luke had played Iain last year and commented on what a nice guy he was as well as the great game they had. Like myself, Iain fields a well rounded army that's played very tactically. This would be a very close fought game as our strategic minds met. I won the roll off and opted to go first. It's my belief that in the Dawn of War mission no one will get any shots off on the first turn. So whoever gets the first volley of fire in the 2nd turn will inflict the most initial damage. I set up nothing and declared that my whole army would rock up on the first turn. Smiling, Iain set up all of his infantry roughly 6" on from his table edge, then deployed a single squad further ahead in some woods. The Tau army arrived and spread out 6" on along the deployment zone. The Broadsides took up position on the hill, ready to fire smart missiles into the Guardsmen in the woods. The 3 Devilfish with Firewarrior teams embarked set up around the centre, looking to fire at the same target. Meanwhile the Skyray and Hammerhead set up further to the left. The Battlesuits walked on in a position to jump back behind the Tau tanks. The 3 Devilfish APCs and Broadside Battlesuits opened fire with their smart missile systems at the Imperial Guard squad in the woods, killing 5 of them, but they held their ground. Iain seemed quite horrified that smart missile systems do no require line of sight and ignore the effects of night fighting. Meanwhile the Skyray was able to spot the Imperial Guard Veterans advancing in their Chimera on the left flank. Two markerlights hit home, which was used by the Hammerhead to spot the transport and reduce its cover save. However, the shot only succeeded in blowing off the tank's multilaser. His tanks rolled onto the board, but were unable to see anything due to the Night Fighting conditions. The same goes for the rest of his infantry. The Chimeras with veteran squads advance. While I could give a hazy turn by turn account of this game, not much really happened, but it was incredibly close! The Chimera on the left disembarked it Veteran squad with 3 melta guns into the rocks because Iain didn't they'd make it that far. He was right, because the next turn massed firepower wiped all by 2 of them out, but they blew up a Devilfish with a melta gun as they fell back (grr), then all the Firewarriors that tumbled out were hit by the Bane Wolf tank and killed outright. The Chimera on the right drove up and the Veterans inside rapid fired their plasma guns (with re-rolls from a special character) into a nearby Devilfish. They did this for some turns until the Devilfish was immobilised, their Chimera exploded and in the final turns the Tau army hosed down the Veterans. It was a very tense game because it took so much of my firepower to wittle down one of his squads and it took a lot of his anti-tank to take out one of the Devilfish, after which an ordnance shell or highly accurate Mortar fire would then take out the squad which had stumbled out of the tank wreckage. Thank goodness I'd gotten the first turn, been lucky with my night fighting and made the most of my Smart Missile Systems to effectively get 2 Turns of shooting before the real fight started or I'd have struggled in this game. The game ran until Turn 7. When the dust cleared I had 2 Battlesuits, 6 Firewarriors and 2 Broadsides remaining. Iain had 2 infantry squads, a mortar squad, a single Leman Russ and a Demolisher. I won the game 8 Kill Points to 7. I shook hands with Iain, having played one of my best and closes games of Warhammer 40K in years. Like myself, Iain is a guy with a well balanced army played as tactically as possible. His deployment was excellent, even that one 'juicy bone' infantry unit to bait me in was well placed. As a result I went a little too far forward with one of the Devilfish, but it all worked out in the end. So day 1 of the Warhammer 40K Grand Tournament came to an end with me having scored 1 Loss, 1 Draw and 1 Win. Not Bad! An excellent battle report Adam, and it made my day that you started it off with my two armies! Tau and World Eaters! It must have been difficult playing the foriegn guy with the dark elder army trying to explain "YOU...TAKE DICE....ROLL..YOU...NEED FOUR OR HIGHER...FOUR, OR HIGHER...I SAID FOUR, OR HIGH- OH FORGET IT!!" Shame to hear you wont start the new tau army until the next 'dex is out. 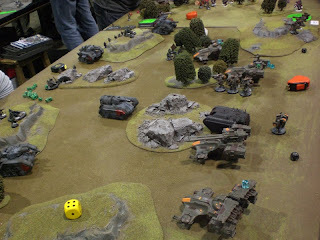 but i hope you will still continue this blog; via friendly games using Luke's army. I'm certainly glad your 'impotence' didn't last all day! All kidding aside, I am glad for your detailed summaries and batreps because it's my chance to live up the tourney scene vicariously through you. I'm with Pearlygates, hopefully you'll still maintain the blog while awaiting the new 'dex. Interesting reports! Thanks for posting as it is neat to see how the tournament scene plays out! Bad luck in the first game, but it sounds like you had some great battles. Thanks for the good write ups - looking forward to hearing about day 2. Your Space Wolves blog is coming on along well though! Great write ups here. I especially enjoy the personalities! Cheers mate. I can only do one army at a time unfortunately. But Warhammer Tau will be updated with the latest Tau news as always. If you're gonna lead the Third Sphere Expansion, have a good read of my tactics at the GT. Part 2 goes live tomorrow! Oh, geez, I didn't realize you had a Space Wolves blog as well! Heheh.